Fusion? Its like cooking, mi amor. You throw in some black beans from Cuba , spices from India , BBQ chicken from down-south USA , add a little salsa from here, a sweet potato from there ….and what have you got? Fusion, blend, mix, spice, something hot, something new, mi amor, something new!’ Contemporary fusion is a spontaneous phenomenon that’s a key element of Cuban musical life. The idea of blending sounds, of mixing one style with another, has been part and parcel of the island’s musical tradition – particularly using African, European, Latin, Caribbean and US styles. More recently, in the early cultural life really opened up. Cultural exports (NG La Banda and Buena Vista Social Club) met with great acclaim abroad, and the influence of many new styles, instruments, sounds and artists poured into the island. The latter resulted in a further, furious musical mix – blending variations of sounds and styles such as the most aggressive punk, trash, rock ‘n roll and hip hop with Brazilian-style birimbao, congas, batás and the most rhythmic clave Cubana – the island’s musicians doing what they’ve always done – mixing and spicing it all up. Today, in Havana, for example, many younger musicians play, write and produce together, and so national and international influences have even more of a chance to flower and bloom. 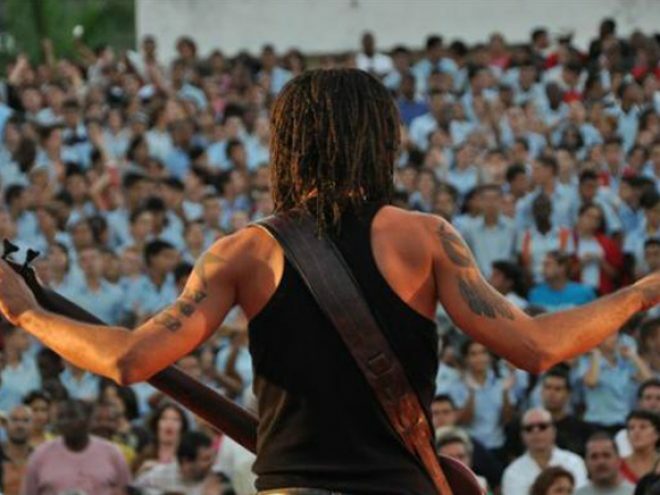 For all Cuba’s deep and long-lived cultural connection with the US, its pretty interesting that one of the latter’s great musical genres – rock ‘n roll – hasn’t really developed on the island as one might have expected. During the early 60´s and 70´s, rock was not well-supported on the island but in the more open 80´s, rock groups began to form, very influenced by heavy metal, trash and grunge, and by bands such as Led Zeppelin, Deep Purple, Nirvana and various Argentinean groups. Despite this, its remained a relatively small movement but we’ve chosen 5 popular bands – Zeus, Rice and Beans, Escape, Hypnosis and Tesis de Menta – that are felt to be most representative of rock on the island. Hip hop beats first trickled into to Cuba in the early 90’s via crackly US radio transmissions, picked up in coastal regions outside of the capital like Alamar and in provinces such as Guantánamo. And then it came pounding in via other musicians and by young walkman-listening, cd-playing, ipod-wearing foreign students and tourists who hooked up, in various ways, with Cuban youth. Rap, Cuban-style, is now very much part of the islands musical culture. In the early days it was met with a deal of resistance but was slowly embraced, and its thanks to the movement that many previously taboo topics have been, and still are, more freely aired and debated. Still, some say its lost its momentum, had its hay day, been co-opted, that so many groups have left the island, and so what’s left? So what is left? Yes, the present-day movement, say rappers, is limited – there’s a great lack of resources and venues – but its still pretty vibrant and one of its great strengths has been, for the most part, its conscious insistence on not mimicking the more commercial, more negative US styles. The idea of disrespecting women, lauding materialism, glorifying violence or expressing homophobia is not the idea at all. These young, mainly black Cuban youth, whatever their beliefs, seem to be more looking for any way possible, directly or not, to speak about things that touch them most – racism, sexism, peace, the environment, sexuality, poverty and social inequalities. We are, one prominent rapper told me, peaceful and positive – but we’re also the insistent voice of youth and its resistance. Cuban reggae is, perhaps, surprising, given its location so near to Jamaica and the Caribbean, a very small scene indeed, especially in the capital. The majority of Rastas and reggae musicians are in the eastern part of the island where, historically, there was substantial Jamaican migration and where, today, there is still a considerable Caribbean influence. However, in Cuba in general, reggae is a tiny movement and the lack of good instruments along with the general lack of connection to this music, all serve to reinforce this. Still, two groups are well worth a mention – Paso Firme and Remanente. Paso Firme are what might be called reggae fusion and, being without a label, they produce their own music. They do, however, have a recording which was licensed in Europe but not distributed on the island. We hear that both Remanente and Paso Firme participated in the celebrated film Havana Blues. Although these electronic/acoustic genres originally developed outside of the island, once they arrived they quickly took on elements of Cuban style, rhythms and beats, and there are now a deal of artists involved in these two areas – most, but not all, associated with Laboratorios de Musica Electro-Acustica. Juan Blanco (1919) is the god father of this centre and this movement, with a tremendous heritage and compositional output, and one of his first pupils, former rock musician, Edesio Alejandro, has, over the years, been best known for his electronic music for film – especially with one of Cuba’s finest directors, Fernando Pérez. More contemporary notables are the young Monica O’Reilly and Sigrid. We’d also like to mention a young experimenter – Fernando Fors – who apparently just works out of his small bedroom, but they say he produces great stuff and is a real innovator.